Called liquid gold by many throughout history, olive oil was used as a prize for gladiators and Olympians alike, and has played an important part in the lives of the Mediterranean people. Long ago, Athena and Poseidon battled it out during a contest to rename the city of Cecrops. Zeus had challenged the two to come up with the most inventive gift to win the rights to the new subdivision of the gods. Poseidon gave the people of Cecrops a spring that would give water and never run out, even during the greatest of drought, but being from the sea he mistakenly gave the people salt water not realizing that salt water can kill. Athena, the smarter of the two, took advantage of his lack of knowledge of humans, and gave the people the olive tree, yielding three gifts from one, food, oil, and fire wood. She won the contest and the city was renamed to Athens after her. Athens is where the roots of our democracy originates. Athena planted the original olive tree on a rocky hill that we know today as the Acropolis. Secretly Zeus was happy that Athena chose the olive tree, thanks to her he was able to discover the martini. The Romans conquered Greece in 146 BC, and the victors took olive secrets to Rome. Angered, Zeus put a curse on Rome for stealing olives from the Gods. Condemning their empire to fail as he could no longer keep Hera occupied and was forced to turn his love Io into a cow. But despite the Romans Greece has remained the greatest exporter of olive oil during the centuries. The olive tree seems to be perfectly adapted for growing in the mild climate of the Mediterranean countries. The trees grow well in dry areas with mild winters and long hot summers, even enduring drought conditions or high winds. The European area of the Mediterranean produces 98% of the world olive oil supply. Olive seed are believed to have been brought to California in 1769 to grow into trees hardy to 12 degrees Fahrenheit. Those olive trees were cultivated in the Franciscan Spanish monasteries. Kids learn to make a moist cake from scratch and not a box. 1.Heat the oven to 350°F and arrange a rack in the middle. 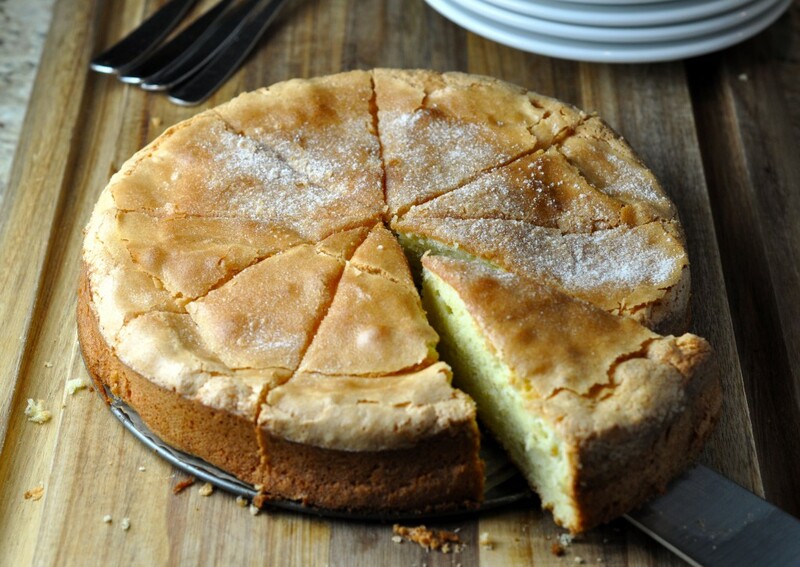 Coat a 9-inch round cake pan with olive oil and flour; tap out the excess. 2.In a large bowl, whisk together the eggs and granulated sugar until well blended and light in color. Add the milk, measured olive oil, amaretto, and orange zest and mix well. 3. In another bowl, stir together the measured flour, cornmeal, baking powder, baking soda, and salt. Add the egg mixture to the dry Ingredients:, stirring until just blended (the batter will be slightly lumpy; do not over mix). 4. Pour the batter into the prepared cake pan. Bake until a toothpick inserted into the center comes out with only a few crumbs, about 40 to 50 minutes. Remove from the oven and place on a wire rack to cool completely. 5. When the cake has cooled, run a knife around the perimeter of the pan and invert the cake onto a serving plate. Dust with powdered sugar, cut into 12 pieces, and serve. Not only is this a wonderful Greek myth about how Athens became the city of Athena told with a modern twist, your Olive Oil Cake recipe is a great finish to a tale and a meal! So wonderful the way you combine the story with the recipe. Great post! This was such a fun read, I’m going to have to locate my oven and try to bake this cake.